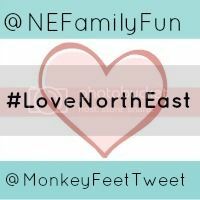 #LoveNorthEast - a place for North East bloggers who love the North East. Welcome to the March edition #LoveNorthEast. It is a place for North East Bloggers to share their favourite posts and discover new blogs or places to visit. This month's featured post is Robots at Life by Monkey-feet. Not only does the post feature lots of fun at the new exhibition but who knew you could get a yummy Sunday roast whilst you were there on a Sunday? Not me! It looks fab and is somewhere we are definitely going to visit soon. 1 - Add our badge (copy and paste the code below into the HTML of your blog post at the bottom. If you are confused - just ask and we'll do our best to help). Alternatively, you can add a text link to this post or Karen's #LoveNorthEast post at the bottom of you blog post so people know where to find us. 2 - Comment on both host posts and a couple more in the linky. It is GOOD to share the love! 3 - You can link up one post every month. Posts must be written by a NE blogger or be based in the NE. Business posts are also welcome and posts can be old or new. 1 - Both comment on every post that takes part. 2 - Share our favourite posts across our own social media (combined 30k+ followers). 3 - Both choose our favourite blog post to showcase in next month's post. Copy and paste this HTML code into the bottom of your #LoveNorthEast post OR add a text link back to this post.